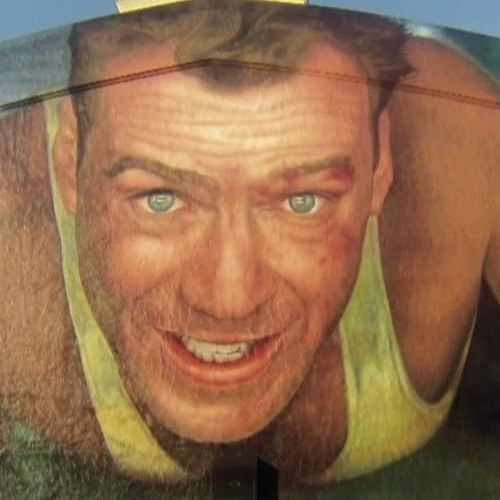 20th Century Fox held a special event on the studio lot yesterday, unveiling an enormous mural of Bruce Willis' John McClane, in celebration of Die Hard's 25th anniversary and the release of A Good Day to Die Hard on February 14. The studio has released a time lapse video that offers a succinct look at this mural's creation, which can be seen on Stage 8 at the Fox lot. Take a look at this interesting video, then read the press release for more information. Twentieth Century Fox marked the silver anniversary of its blockbuster Die Hard movie franchise on January 31st with a ceremony on the historic studio backlot, during which a massive mural depicting the film's iconic hero John McClane was unveiled in front of Stage 8. Bruce Willis, who has essayed McClane in all five Die Hard pictures, including the latest installment, A Good Day to Die Hard, attended the ceremony, along with his co-star Jai Courtney, who portrays McClane's son Jack in the new film, and its director, John Moore. The festivities included a reception on the 21st floor of the Fox Plaza, which Die Hard fans will recognize as 'Nakatomi Plaza' - ground zero for the non-stop action of the landmark original film. Here's what Bruce Willis had to say about playing this iconic character for 25 years. "One of the most exciting things about playing McClane is that he's definitely not a superhero. He has no special powers or abilities. He's a regular guy to whom anybody can relate. While we're always pushing the envelope to create great action sequences, I think it is McClane's relatability and sense of humor that really draws in people." 20th Century Fox Film chairman and CEO Jim Gianopulos also released the following statement. "Twenty-five years ago, Die Hard, John McClane, and Bruce Willis thrilled audiences around the world and set a new template for action and adventure. Now, on the eve of the release of A Good Day to Die Hard, we were delighted to celebrate and honor this enduring part of our studio's legendary history with this mural unveiling." Separately, Twentieth Century Fox Home Entertainment will release the Die Hard 25th Anniversary Blu-ray Collection including the first four Die Hard films and featuring an all-new 60 minute bonus disc, 'Decoding Die Hard,' on January 29th. The Die Hard mural joins murals celebrating Star Wars: Episode V - The Empire Strikes Back, The Simpsons, The Sound of Music, The Seven Year Itch, and The Ox-Bow Incident which adorn other Fox stages. When Die Hard exploded into theaters during the summer of 1988, it launched a new cinematic hero, John McClane, and changed the paradigm of action movies. McClane is identifiable and relatable - an ordinary man forced by circumstances to attempt extraordinary tasks. That is what separates him from the comic book heroes of most action movies, and has made McClane one of the most endearing characters in film history. Die Hard 2: Die Harder followed in 1990, with Die Hard With a Vengeance arriving in 1995 and Live Free or Die Hard in 2007. A Good Day to Die Hard hits theaters everywhere February 14th.